Austin Frakt has a nice post discussing the ways in which Obamacare provides labor market tax relief, responding to Casey Mulligan’s latest post discussing the labor market taxes that it imposes. I have blogged several times about Casey’s work painstakingly documenting the impacts of the ACA on the labor market, and noting the tradeoffs at work in any mean’s tested program. I agree with Austin that Casey misses some of the impacts when someone leaves employment, such as foregoing the subsidy that comes from the tax exclusion of Employer Sponsored Health Insurance which is a subsidy no less than an exchange tax credit. I commented on Casey’s work at the UNC Tax Symposium back in January (here are my slides as discussant UNCtaxconference.1.18.14) and also noted that he had left out a subsidy in his calculations that is foregone when someone leaves employer sponsored insurance to go onto the exchange. A demonstration of how different means of structuring and financing insurance subsidies impacts the labor market would be a very useful set of analyses, particularly if the same framework was applied to the nascent Burr-Coburn-Hatch PCARE proposal. While the exact magnitudes are unclear, the PCARE proposal will increase the marginal labor income tax rate for a variety of reasons, but most clearly because it provides tax credits between 100%-300% of poverty only. 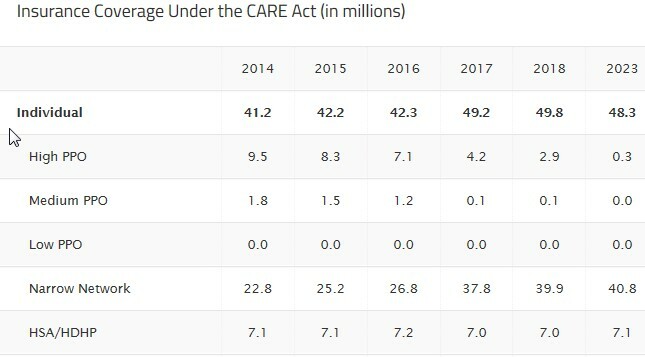 There is a private score of PCARE that doesn’t address Casey’s focus, but the numbers haven’t been updated since they backed off their original plan to end the tax exclusion of ESI (meaning what is called “miswording” by conservatives who were mad about what they viewed as taxing health plans was what was done in the private score, and that attribute of the score does almost all of the deficit reduction work in the score). Casey’s framework is a useful one that highlights the impact of policy on marginal tax rates of labor income. The framework could usefully be added to macro level financing and insurance coverage impacts that are generally the focus of legislation scores. Lets shine the bright lights everywhere, and in a consistent fashion, and identify the alternatives so that we can do what you do when you engage in policy: make tradeoffs. The CBO Budget Outlook (2014-24) is out today, and much of the focus is on their revised estimate of the ACA’s impact on the labor market (Appendix C, pp. 118-27). CBO is projecting that “the ACA will cause a reduction of roughly 1 percent in aggregate labor compensation over the 2017-2024 period, compared with what it would have been otherwise” (p. 117). This is basically CBO’s estimate of the impact of the marginal tax rate on labor income created by the various policy structures of the ACA that Casey Mulligan has written about. As I wrote in this post, you get less of something if you tax it, so if that is not your goal (it is with tobacco taxes, for example) then you are left to decide whether the reduction is worth achieving an alternative goal(s). That can be a difficult question to answer, because you are trading off important things–labor market participation, rates of uninsured, and the system reform provisions of the ACA. Is reduced labor market participation a sign that we should move away from the structure of the ACA? If yes, to where? While the numbers haven’t been run yet, Casey says that the marginal tax rate of labor income in PCARE will be similar to those in the ACA. Why is this? It is primarily because PCARE provides tax credits from 100% to 300% of poverty (the ACA goes from 100% to 400%). The intuition of wanting to target and not waste precious resources that leads us to design means tested programs creates higher marginal tax rates on labor income. This reduces incentive to work more hours, and you get results like what CBO predicts for labor compensation (Casey predicts even higher impacts than does CBO). Casey expects a similar impact from PCARE, because of its means tested subsidy structure (it is worth remembering that it was the income based means test structure of tax credits in the ACA [Table 1, p. 48] that created the largest work disincentive in Casey’s paper, not the employer mandate). The Republican reform plan PCARE shares this means tested structure. It is relatively easy to sketch a distant health reform approach, be it left, right or center, if you can control all of the variables. However, you cannot control them all, and we can only begin to transition from where we are now. If we decide that minimizing negative work incentives is paramount, then means tested subsidies are a bad idea, and some sort of universal approach, or flat financing mechamism seems warranted; but that will undermine employer sponsored insurance rapidly if flat subsidies are large, or lead to concerns about what can be bought with them if they are small (The Patients’ Choice Act from 2009 had flat subsidies, that were small as compared to the cost of insurance). If we decide that we want to minimize crowd out of employer sponsored health insurance and to minimize disruption, then that favors means tested subsidies, while seeking ways to keep employer sponsored health insurance as stable as possible (employer mandates). However, today we are worrying about the impact on the labor market of the ACA, that does just these things. I am drawn to the question “how do you want your children (or grand children) to get health insurance in 20 years?” I think that a distant system in which employment is not a means of obtaining health insurance would be a better way to do it, and could lead to more risk taking in the economy. And the ACA as eventually modified in some way by the Republican PCARE proposal can be the first steps to this, assuming near continuous tweaking for the rest of my life. The alternatives to this muddled through approach strike me as politically impossible (big bang single payer, ESI level of flat subsidy provided to everyone), or are unknown to me. Update: I am unsure of the magnitude of the disincentive effect of ACA v. PCARE (meaning, which one is more disruptive to labor market). Someone needs to run the numbers, and I have suggested to Doug Holtz-Eakin and Steve Parente that if they did this in a dispassionate manner, it would be a great service to the debate. I think the density of workers from 100-300% of poverty v 100-400% is important, and am also uncertain of how the high risk pool structure in PCARE and the tax treatment changes proposed in PCARE will impact these calculations. What about the ACA/under age 65? Brad Flansbaum sent me a link to a private score of PCARE, the reform plan released on Monday by Republican Sens. Burr, Coburn, and Hatch. I don’t know the Center for Health and the Economy, though I do know several members of their advisory board and many of you will as well. I don’t have my own simulation model to be able to verify these sorts of results, and the CBO is the final word, but I will just assume that a group that has Uwe and Holtz-Eakin on the Board must be somewhat credible. There is much to be learned here, even if you assume this to be an overly optimistic score. First off, lets just say that the rage machine that has been perfected to argue against the ACA could get plenty cranked up from the these results. There is a breathless Americans for Prosperity Ad running in North Carolina talking about a nice lady losing her doctor in an Obamacare plan, in health policy speak, due to the rise of the narrow network. Yep, this score says PCARE will have a slight increase in persons covered by 2023 compared to the ACA, but most of that arises from a shift of people into narrow network plans. With respect to patient’s access to their providers of choice, the CARE Act is expected to achieve similar access to current law, based on the H&E Provider Access Index (PAI). The proposal is projected to reduce the average PAI in the individual market, due to an influx of consumers enrolling in low-cost narrow network plans. However, that reduction is offset by a reduced reliance on Medicaid to insure the low-income population. On premiums, the analysis says they will be generally lower in the non employer market, but most of the decline is among individuals and not families. By 2023, the proposal is expected to yield substantially lower premiums than current law in individual insurance product categories with savings of 2 – 11 percent for single policies. H&E predicts that family policies will see a modest decrease ranging from 0.3 – 1 percent. Yep, most of the action is achieved by the capping of the tax exclusion of employer sponsored health insurance. You know what this would be called if this (good in my opinion) policy were to replace the cadillac tax in the ACA? A Trillion dollar tax increase (Ah-Trill-Yun! with scary music in the background). The Medicaid changes which will result in blood on the floor debate yield around $150 Billion in savings over 10 years, and the savings from medical malpractice reform are essentially a rounding error in the context of the 10 year federal budget. 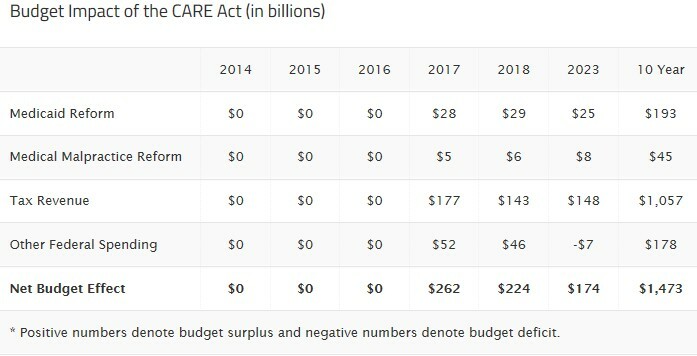 So, this score says that PCARE will achieve similar levels of insurance coverage as the ACA by 2023, and will result in a reduction of the federal budget as compared to the ACA, primarily by shifting people into narrow network private insurance plans, and increasing taxes of persons with generous employer sponsored health insurance. It doesn’t analyze the generosity of benefits covered (at least that I can tell, but they had to make assumptions), nor does it identify the impact on out of pocket costs that will result in these coverage levels; these are important items to understand, especially given that there are no proposals about transitioning to different models of care and the like. Taking a look back in time through the lens of this proposal, I can’t help but thinking that Sens. Burr and Coburn missed a big opportunity in January 2010, by not throwing Sen. Olympia Snowe a lifeline (remember, she voted for ACA out of the Senate Finance Committee), which would likely have brought along Sen. Collins. Those four together could have gotten a lot once Scott Brown was elected. Instead they choose full opposition, and gross over-statements in their arguments against the ACA, especially given the proposal they now put forth. In the end, they helped to create and exacerbate the political culture that will make it so hard for their proposal to be given the subtle, and nuanced listen that it deserves. Update: I am trying to get details of the model, assumptions and the like. I have requested it officially for the site that put out the score. I have also been talking on twitter with members of the Advisory Board. I think the model is an update of Steve Parente’s model (old one, paper likely behind new one). Will confirm/clarify as I get info. Update 2: I confirmed that Steve Parente did the simulation. Here is a pdf of the paper linked above Parente.hesr_12036 behind the model, published in HSR. However, it is based on ACA uptake after SCOTUS ruling, so I am still trying to understand PCARE assumptions; Steve and I are going to talk. Update 3: Loren Adler has 7 important questions/points in his twitter timeline about detail gaps in the private score. I have conversed quickly with Steve Parente via email, but don’t have enough yet to clarify. I will likely do so in another post when I understand more. It acknowledges gravity, while making changes. While PCARE talks of repeal of the ACA, it locks in a good deal of the structure of the ACA, and addresses changes from that new status quo. For example, no lifetime limits (sec 201) is retained from the ACA, as is keeping people up to 26 on their parents health insurance, while the current 3-to-1 age banding premium regulation is replaced with 5-to-1 (now a 64 year old could not be charged more than 3 times what a 20 something could be charged;now they could be charged 5 times as much). Winner 20-somethings, loser 60-somethings. Eventually they say they plan to allow States to set these rules with a looser federal touch, meaning a state could decide to stick with the 3-to-1 premium banding by age, for example. I want to hear more about guaranteed renewability and related insurance market regulations as the 2nd full paragraph of page 2 is a bit slippery. For example, it contains this quote: “Insurance companies would also be banned from making unfair coverage terminations of health coverage.” (emphasis mine). What might “fair” ones be? Continuous coverage provisions could provide lots of incentive for people to sign up. Section 202 seeks (I think) to replace the ban on pre-existing conditions as a forever standard with an “everyone has a chance to come in once” and then continuous coverage provides you with protection once you do so. This is more along some of the earlier individual mandate logic of responsibility. Subsidies to buy private insurance (or health care directly) are pared back to 300% of poverty level. Down from the 400% of poverty max in the ACA, and the credit could be used to pay directly for health care under PCARE. They have dropped the Patients’ Choice Act flat tax credit for singles and families and gone to an age banded structure, with the table below being for those at 200% of poverty. Duke’s employer sponsored plan costs about $1,450 per month, so the tax credit for my age ($6,600) is less than half of that. At my income there would be no subsidy (as with the ACA), but the no subsidy level now will be around $35,000 for singles, and $65,000 for families. These credits will finance catastrophic levels of coverage compared to what most now have, but of course advocating catastrophic coverage with people paying more is a policy approach. Lets see if they own up to what this will purchase. I would love to see a comparison of OOP and premiums of what these subsidies will finance as compared to the ACA. However, this could mute some of the incentive to move out of employer sponsored coverage to exchanges that tax treatment of ESI changes proposed will kick off (see below). [update: a data driven comparison really is needed; Larry Levitt via twitter was pointing out many details will have to be clarified to allow this]. Default enrollment. Section 204 allows states to default enroll people “who have a health tax credit but who fail to make an affirmative choice in choosing a plan within a specified time frame.” People defaulted into plans could change, or affirmatively choose to go uninsured. I think the default/auto enroll is a good idea. I have proposed that North Carolina do this using Section 1331 of the ACA (Basic Health Plan) and a Medicaid expansion waiver. Transition to capped Medicaid amounts given to States. The Medicaid section (301, p. 5-6) covers lots of complicated territory and many more details are needed. However, I am going to grant the benefit of the doubt and say lets talk more about this. The parts of what they write that I like include acknowledging the distinct “sub programs” within Medicaid and the fact that they are not the same and do not have the same needs. The part I like the least is that for the dual eligibles and the disabled, the acute care financing stays the same, while providing a capped amount for the long term care costs of such persons to be given to the States, with the States retaining the responsibility for the remainder of the long term care. This locks in the two-payers problem with these sickest people in the nation, while shifting LTC burden to states. I am willing to listen here, but would rather Medicare federalize the acute care side of the duals if they want to shift LTC responsibility to states (there is lots of policy in that last sentence, I will clarify later). Medical Malpractice reform. This is not a great place for federal intervention, and that has always been a problem for Republicans. However, their writing about it puts back in play a piece that has always been one of the political stepping stones to a health reform deal (I wrote this in 2009). The latest issue of Health Affairs has lots on Medical Malpractice, an issue that went nearly completely away for several years, which was a sign Republicans didn’t want a deal. It coming back means some of them want one. I included Medical Malpractice and patient safety (two sides of the same coin) in my white paper on N.C. Health Reform that I put out two weeks ago. Most of the action here will be state level. Title VIII of PCA is dead. This makes me sad.What a strange chapter of health reform was the appearance of unelected boards in a Republican bill one month before the first version of HR3200 was passed out of the Commerce committee, and then unelected boards became such a rallying cry for Republican opposition to the ACA. It was also hilarious how none of the sponsors would own up to it being their idea, but I digress. Cap the tax exclusion of ESI at 65% of an average plan’s costs and grow at CPI+1%. Sign me up; let’s replace the caddy tax in the ACA with this. I’ve written about this over and over. Keep in mind that this will be quite dislocating for employer sponsored health insurance. That is where I want to go down the road, but 3-5 Million people with cancelled indy policies just about ground health reform to a halt in November/December with an assist from a screwed up website. 165 Million people have employer sponsored health insurance, most of them have no idea that get tax free income from it, but all of them will be sure that they deserve it, once they find out they are going to lose some of it. Sponsors/Politics. Interestingly, Bur and Coburn lost Paul Ryan and Devin Nunes in the House as co-sponsors (these 4 co-sponsored the Patients’ Choice Act). Burr and Coburn introduced the Seniors Choice Act in 2012, and those Medicare-specific reforms are not contained in today’s-released PCARE. Do they still support Seniors Choice Act? Senator Hatch last year introduced his own bill with a mix of things (his Medicaid ideas seem to have come through most clearly in PCARE). My political analysis goes two ways on this. First, if members of the House co-sponsor then people like me say mark up the bill and get a CBO score since they control the House, and they don’t want to do that (and Dems aren’t going to mark this in the Senate). It is a definite advantage to have a plan that is not subjected to such scrutiny. At the same time, when there is a deal someday, it seems almost certain to pop out of the Senate, just like the fiscal cliff deal did. Not sure when that will be, but this is a step towards that day, and I welcome it.